Prep Time: 20 min. | Total Time: 3 hours 20 min. Per Serving: 320 calories, 22g total fat, 14g saturated fat, 85mg cholesterol, 230mg sodium, 28g carbohydrate, 1g dietary fiber, 22g sugars, 5g protein, 10%DV vitamin A, 0%DV vitamin C, 6%DV calcium, 0%DV iron. Size Wise: Place completely unwrapped package of cream cheese in microwaveable bowl. Microwave on HIGH 10 sec. or just until softened. Add 15 sec. for each additional package of cream cheese. How to Soften Cream Cheese: Enjoy your favorite holiday foods while keeping portion size in mind. 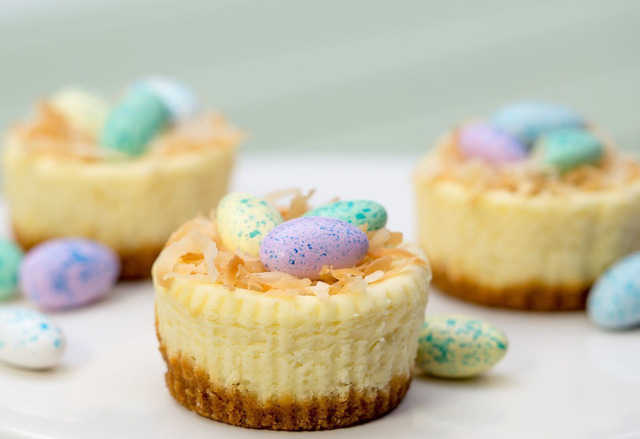 One serving of PHILADELPHIA Easter Mini Cheesecakes is one. Wow...something new to an old treat...Awesome!!! Thanks for sharing.